This will probably be the last one i ever do. I made one while i was in NEMESIS, but i had to remake it since i joined a new clan, AEGIS. 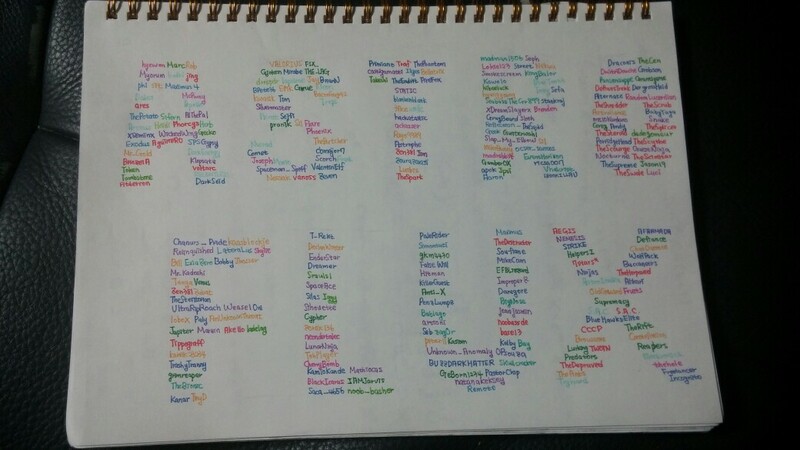 Took me around 6 hours to take note of all the afk/active players that i have at least met once or interacted, and tried my best not to miss anyone that i would regret not writing. If i did miss some, i'm really sorry. My memory really has limits XD. This time, every letter has its own unique meanings, but the order of names inside the letter does not mean much, though the ones that first comes into mind is usually on the first ones. Also, your game-names are mostly your first in-game names, just in case it might get confusing. Your name color has its own meaning too. It relies from the one of the colors of your clan, your playstyle, or your ship color. For example, Myorum-AEGIS (red), ship color (purple), and corr user (green). (still, some are random lol.) I hope you find yourself inside there, good luck! Thank you for leaving behind this record of the people that made Astroflux Astroflux. Speaking of people that made Astroflux to what it is today, I can't seem to find DaGGerz, and in my opinion he has been among the most influential people if not THE most influential person in Astroflux. But I guess some recognition is a little too much to give. And yes, it legit frustrates me because DaGGerz is a great person. TheDodger wrote: Very nice work hyewon!! Myorum wrote: Cool, great work hyewon! Very very nice. A graphic reminder of many players that would love to see again. They made this game great. Holy heck awesome again! I wasn't forgotten this time x) O Letter, next to porridgehead and the waves of "TheS" usernames, Missing SirAl aka TheSurgeon aka TheShredder! Either way hope to see him in pocket starships or some other games!